Winter wreaks havoc on my skin. Last year was especially bad. My normally combo skin with occasional breakouts became dry and flaky, increasing breakouts. The problem for me was that my skin still produced a lot of oil, so by the end of the day I had flaky oily skin. And I really mean flaky, as in, you don’t even have to be close to me to see my skin is coming off. If I touched my face and disturbed the oil, I brought up flakes. It was bad. I struggled with skincare through all last winter, never coming up with a regimen that worked. This fall, when I noticed the same thing was happening again, I knew I needed to fix it ASAP. I have found a routine that works thus far. And actually, my skin look brighter too, which is always nice!! Cleanser: Clinique Facial Soap Bar (oily skin), $13 – I’ve used this for years and love it. It takes all of my makeup off and leaves my skin so clean feeling. Its not expensive and this bar last for so long. I’ve had mine for about 6 months. Toner AM: Clinique Acne Solutions Clarifying Lotion, $14 -I started using this a few years ago and it really does help keep my breakouts to a minimum. The 1.5% salicylic acid is a little drying, so make sure you use a good moisturizer. Toner PM: Clinique Clarifying Lotion #2, $12.50 – I’ve also been using this for a long time. It takes off all my makeup residue without stripping my skin. Eye Cream: Fresh Crème Ancienne Eye Cream, $95 – This is a product I’ve only been using for about a month. I got a sample from Sephora and fell in love. The cream is so concentrated and goes on on so smoothly. It brightens up my undereye area and may actually be reducing the wrinkles. I actually never used an eye cream regularly before this because every product I tried was too irritating or didnt do anything. But this is wonderful. I feel silly spending this much on my moisturizers, but dull skin with wrinkles at 24 years old is a little depressing. And this jar will last ~6 months, which isn’t too bad. Serum AM: Dior Capture Totale One Essential, $95 – I’ve used this a number of times in the past, and would use it continuously if I had enough money. This serum makes my skin look amazing. It helps everything clear up, tightens my pores and brightens my skin. I only use it when I really need it, because if I used it every day it would only last two months. Its one of those “just in case” products. 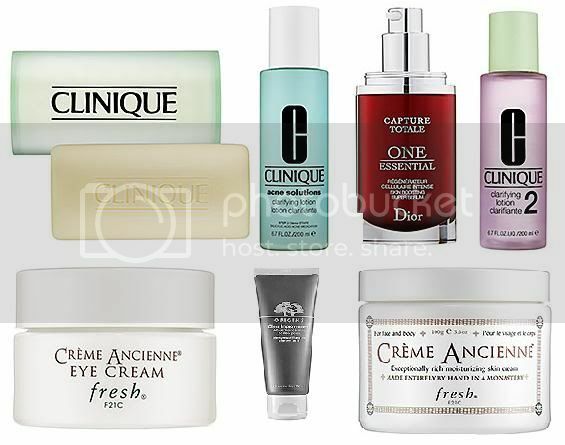 Moisturizer: Fresh Crème Ancienne, $135 – Yes, this is the most expensive moisturizer I ever used. The story is similar to the Fresh eye cream: sample-love-buy. This cream is so concentrated its practically a solid. You only need the tiniest bit to cover your whole face, so this will also last a very long time. But it keeps my skin moisturized so there are no flakes. My skin has not broken out from it either, which is amazing. Normally I got one or the other, flaky skin or broken out moisturized skin. Its not the case with this product, at least not yet. And Sephora offers free returns, so I can always send it back if it stops working (which I hope doesn’t happen). *I’ll be trying Fresh Black Tea Age Delay Cream soon because it was a free sample (.68oz) in Sephora’s 500 point perk! The cream is $95/ oz, so this is a pretty good deal. Hopefully it works as well as the other one!! Masks: Fresh Tea Instant Perfecting Mask, $85 & Origins Clear Improvement Active Charcoal Mask To Clear Pores, $22- I use masks whenever I find the time. I feel so relaxed afterwards, an added bonus. These are two that give me great results without irritating my skin (I always seem to get little red bumps everywhere after using masks). I never thought I’d struggle with skincare after my teens (wishful thinking!!). I guess its an on-going battle. I’m happy that I gave in to a few more expensive products. To me, it really is worth it, vs being upset and stressed out about having bad skin day after day.